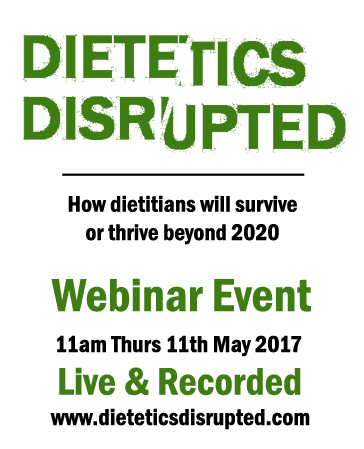 Get free & immediate access to the complete recorded Dietetics Disrupted webinar package (video, slides, transcript, reading list, CPD quiz). The dietetics profession is at the threshold of a new era. Corporate sponsorship of dietetic organisations has become a global hot topic, traditional dietetics careers are being redefined, and technology is rapidly shifting how our knowledge is accessed and communicated. Why is this happening? And what do dietitians and dietetic organisations need to do to stay relevant in our rapidly changing digital world? Understanding these issues, identifying the opportunities for growth and learning new approaches are crucial, now more than ever. This webinar presents a timely update on the disruption of the dietetic profession, the impact of corporate sponsorship on consumer trust and explores new ways dietitians can work and thrive in the nutrition marketplace. Whatever happened to ‘expert authority’? What are some ways in which Big Food impedes public health? What does the research science say about conflicts of interest and bias? How can health organizations select suitable partners and sponsors? How can dietitians advocate for more ethical and responsible partnerships? Why the future is now. What is happening in other industries and professions that we can learn from. Where to find digital skills or partners to progress your mission. How to apply new business models to your work for the future. How human skills can complement digital skills in future proofing your work. Fake news, alternative facts and the loss of consumer trust - joining the dots. What the rebellion against experts means for dietetic organisations. What every dietitian can say and do to build trust and their success. New public nutrition messages and communication for a new era. How to help transform dietetics into a movement for wellness. Louise, Andy, Tara and Matt will answer questions and discuss the dietetics disrupted topics that are posted by webinar attendees and appear on social media. The speakers will also quiz each other on their presentations, perspectives and their predictions about how dietitians will thrive in the future. Louise is the author of the new book ‘Eating Ourselves Sick’ published by Pan Macmillan, January 2017. A former corporate strategy consultant in the retail and consumer market sector, Louise’s path deviated from plan when she developed an autoimmune disease which eventually resulted in an organ transplant. Curious about the rapid rise of food based chronic diseases and dismayed at the ability of Big Food to infiltrate the end user experience of even innocent hospital patients, Louise began to investigate the history of the corporate food supply and how it relates to today's epidemic of preventable chronic diseases. Andy is a Las Vegas–based dietitian with a plant-based, whole-foods approach. He is also a co-founder and the Strategic Director of Dietitians for Professional Integrity, a group that advocates for ethical and socially responsible partnerships within the Academy of Nutrition and Dietetics. 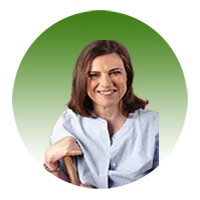 Tara is a passionate dietitian who has worked in almost all fields of dietetics. Entrepreneurship is where her passion lies, and she has worked in self-employment for her entire career. Currently, alongside her consulting, communications and academic work, she is an Entrepreneurship Facilitator in Cairns, working with young people to help them create their own job. Tara believes in innovation and creating multiple income streams. As health professionals, we can have this happen ‘to’ us, or ‘with’ us. She wants to enhance dietitians and move the profession forward, which is why she is currently standing for the DAA board. Matt is passionate about nutrition advice that evokes change. He directs SmartShape’s programs and resources that inspire health professionals to make a difference with every interaction. As an Accredited Practising Dietitian he knows the science, and as a marketer, he knows dietary trends and how consumers think and behave. 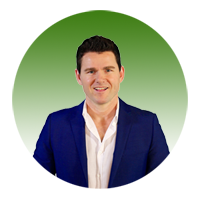 Matt has been the nutritionist for the Australian Consumers’ Association, weight loss coach for Men’s Health Magazine (Australia) and a TV regular providing nutrition and dietary advice for over 20 years. His weight management program, Metabolic Jumpstart has attracted over 24,000 participants. Information provided in the live event, slide notes, and web links are general nutrition advice and are not meant to replace advice provided by your health care provider. SmartShape Pty Ltd or the speakers are not liable for any claim or mishap resulting from your participation in the event, from the recorded package, or by your use of the GoToWebinar service. You should always seek the advice of your health care provider before starting any diet program. By entering your details you agree to receive updates from SmartShape. You can unsubscribe at any time. You'll get a PDF download of access instructions immediately. Follow this event on Twitter & Facebook. Download & share the image below. SmartShape provides inspiring tips, tools and training in nutrition and weight management.